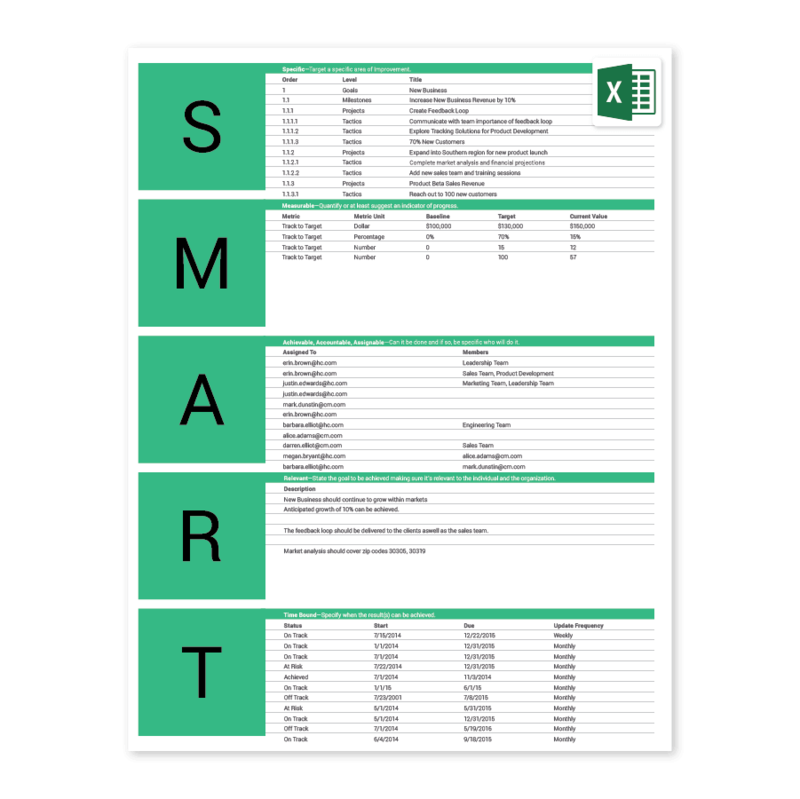 A free SMART Goals Excel template to fast-track your goal setting process. Goal setting is your framework for success. Goal setting is the most critical step in the process of planning and executing against any key objective, initiative or campaign designed to achieve measurable results. There are a number of goal management methodologies organizations and individual contributor use to obtain their goals. One of the most common methods is creating SMART Goals. SMART goals are relatively easy to understand and universally applicable to a wide range of projects and initiatives. Creating SMART goals can help you better manage and ultimately achieve your vision. So what exactly makes a SMART goal? S: Specific. A goal of “being the best” is too broad for specific execution. Make your goals more specific steps that will ultimately lead to you being the best. M: Measurable. How will you tell if you are heading towards your goal? If you have metrics that will measure it, you will be much more likely to execute it. A: Attainable/Achievable. Your goals should be lofty enough to inspire but not so big as to be unrealistic. Have big dreams for your company overall, but set smaller goals during the S.M.A.R.T. planning process in order to reach those lofty heights. R: Relevant. Make sure your goals apply to you, your company, and what you want to accomplish. T: Timely. Set a date for completion.